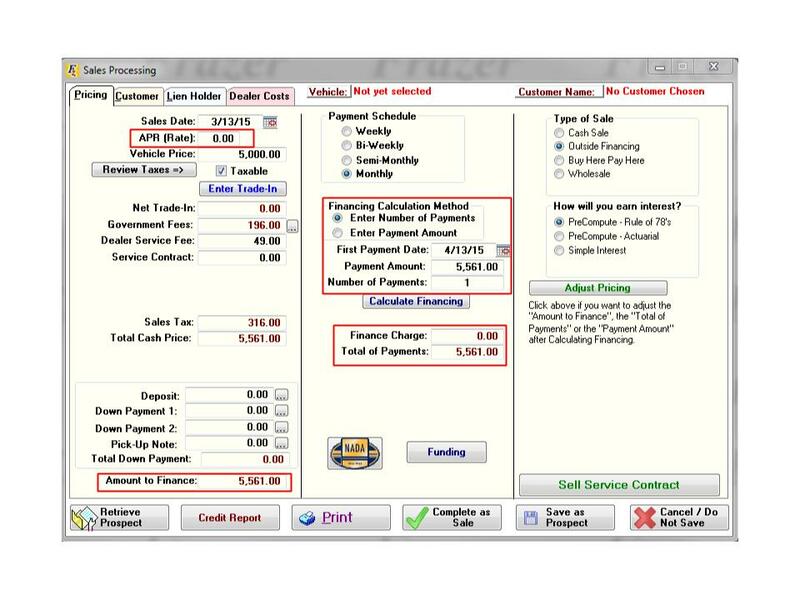 To write up an Outside Financing deal, click on "Enter Sales" or enter via drop-down menu from Sales > 1 - Enter Sales and select "Outside Financing" in the top right of the "Sales Processing" screen. 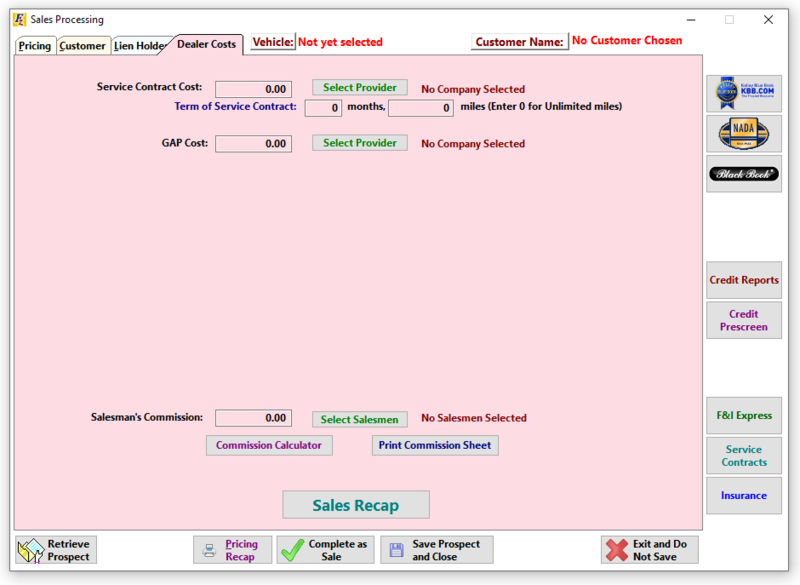 Click on the screen-shot below to learn more about various aspects of the "Enter Sales" screen. 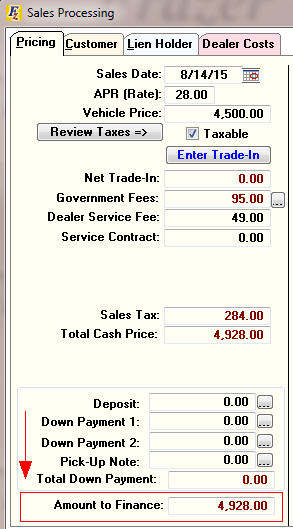 There are four tabs that you will use to enter an Outside Finance sale. 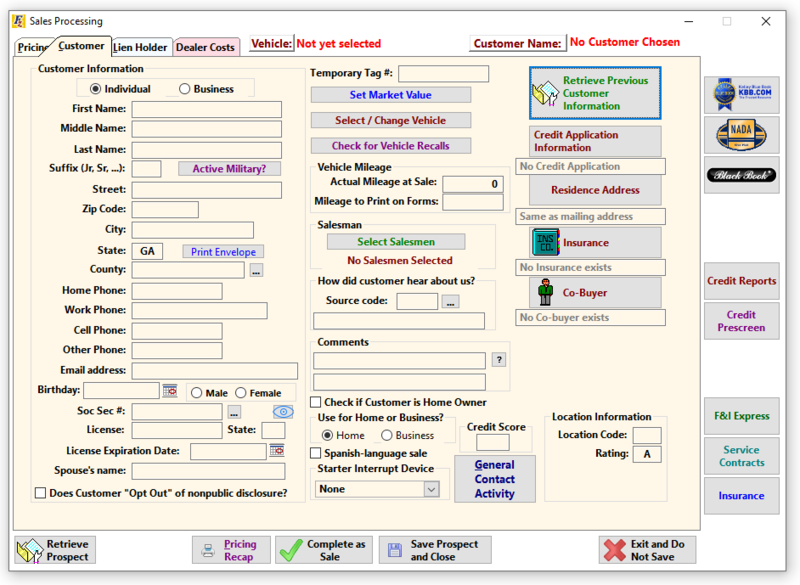 These include the Pricing Tab, the Customer Tab, the Lien Holder Tab, and the Dealer Costs Tab. Once all of the information is entered you have the option of saving this to the Prospect File or as a completed sale. Remember that when the information is entered for a prospect, changes can still be made to the sale figures and all forms can still be printed. Once it is saved as a sale, you are unable to change any pricing information unless you cancel the sale and change the information for the customer in the prospect file. ▪PICK-UP NOTE PAYMENTS - You can enter a schedule for pick-up notes (deferred down payments). This reduces the amount financed. ▪PAYMENT SCHEDULE – Once you have established an amount to finance, a payment schedule needs to be selected. Options include Weekly, Bi-Weekly, Semi-Monthly or Monthly. Your selection will determine a first payment date which can be modified if needed. •FINANCING CALCULATION METHOD – There are two options for determining the financing for a deal. You can select to enter either a payment amount, or a number of payments. 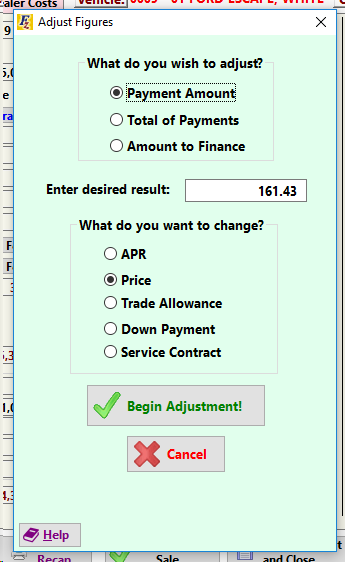 For example, if you enter a number of payments the system will calculate the payment amount. If you enter a payment amount, the system will calculate the number of payments. 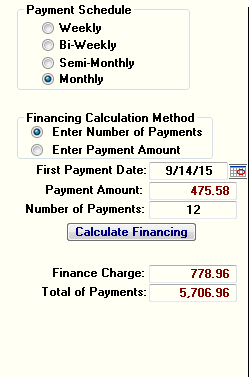 Once the financing is calculated, it will display the total finance charge and total of payments. For most financial institutions you will choose "number of payments" as most banks will NOT finance a deal with an odd final payment. 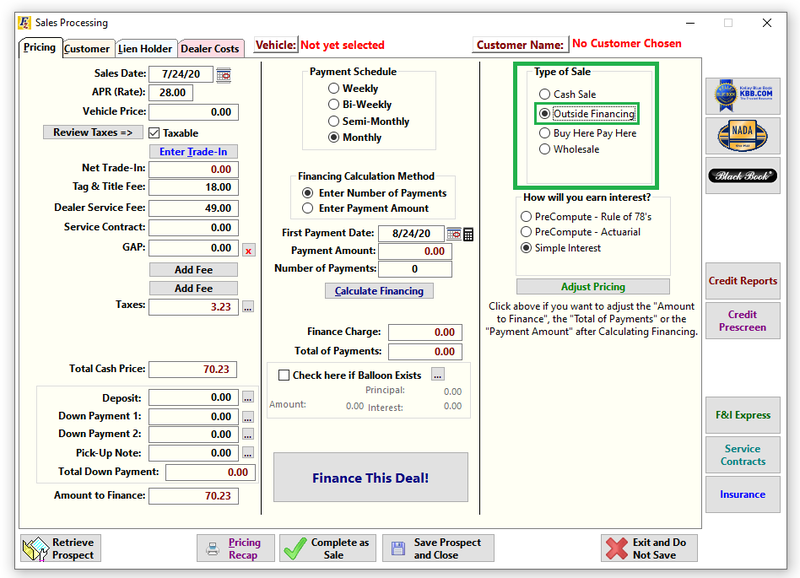 ▪ADJUST PRICING – (Note: for matching outside finance numbers [Payments are within cents], click here!) Once you have calculated the financing for the sale you may want to "tweak" the numbers. This can be accomplished using the Adjust Pricing button. You are asked what you want to adjust, i.e. Payment Amount, Total of Payments, or Amount to Finance. To make this adjustment you also enter what you want to change such as APR, Price, Trade Allowance, Down Payment or Service Contract. These adjustments can be made until you get acceptable finance numbers. 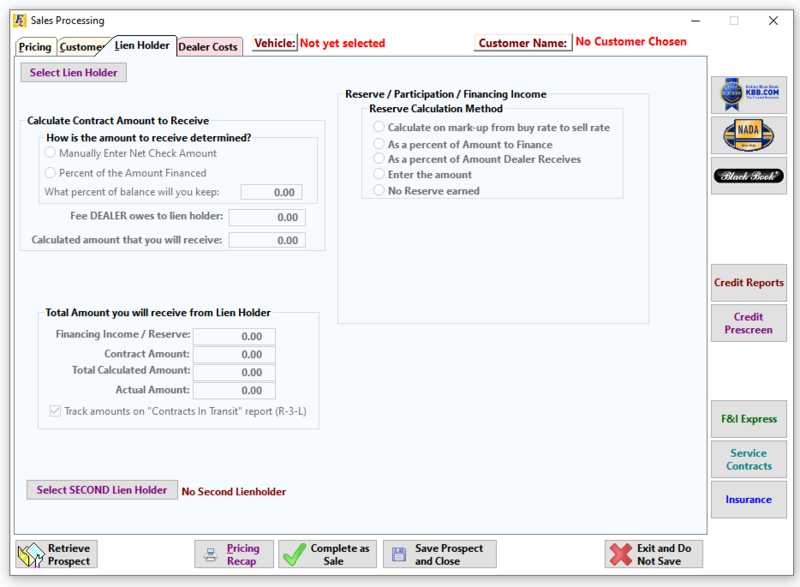 •LIEN HOLDER TAB – For Outside Finance deals, you will select the lien holder on the Lien Holder Tab. Information that was entered for the lien holder that was selected will display as well as a calculation of the amount due from the lien holder. This information can be changed if needed. Also, the Lien Holder you select here can be changed after the sale is completed: Removing/Changing a Chosen Lien Holder. The system will also allow you to select two lien holders for a deal if necessary. You can also use this tab to calculate your Reserve. For more information on entering lien holder information, click here: Entering Lien Holders. 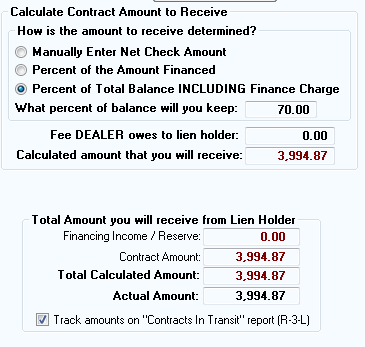 On the Lien Holder Tab you can also enter the "Net Check" that you as the dealer are receiving from the Lien Holder. It can be calculated based on a percentage of the total amount financed or determined via a fee you may owe the Lien Holder (in the form of discount). You also have the option to enter the Actual Amount you receive manually. Any difference will reflect as a Financing Cost on the Sales Recap. (Assuming you are NOT receiving the full amount to finance). The amount to finance is total cash price – cash down – pick-up note. Like the name sounds, it is the amount you are going to finance, BEFORE any finance charge is added on. The amount to finance + finance charge makes up the total of payments. This total of payments is the customer's remaining balance (not including any pick-up note balance). For information on how to calculate the Reserve you will receive, CLICK HERE. If the lender is printing all the paperwork for this deal, but require a Bill of Sale, that shows an Amount to Finance, process the sale as Outside Financing. Add the Lien Holder normally. But set the APR to zero, and add one (1) payment to reflect the payment that you will receive from the lender. * Some lenders may require you to match their financing numbers exactly when doing a deal. Once you have verified the Amount to Finance is exactly correct, make sure you check the Sale Date, APR, and First Payment Date. Set the Financing Calculation Method to "Enter Number of Payments"
You can enter both the amount of payment, and the payment amount, and then just tab to update. Do not "Calculate Financing". If the Finance Charge and Total of Payments are correct, you can complete the sale. •Select Outside Financing as Type of Sale.